An officer of the Nigeria Customs Service, Baba Nwaguyawo, has been crushed to death while attempting to stop a convoy of the Nigerian Army at the Agbara end of the Lagos-Badagry Expressway on Friday. The convoy was reportedly used as a diversion to smuggle some cars into the country. 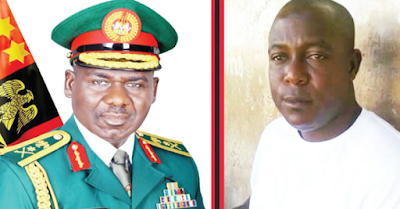 According to Punch Metro learnt that operatives of the NCS at the Agbara checkpoint had attempted stopping the convoy for a routine search when a Nigerian Army van piloting the fleet killed Nwaguyawo. anti-smuggling operative of the Federal Operations Unit, Zone A, Ikeja, Lagos. It was learnt that the four vehicles, suspected to be smuggled under the guise of Army convoy, were two units of Mercedez Benz Sports Utility Vehicle ML 350, one Toyota Venza, and a Mercedez Saloon car. A source said, “The incident happened on Friday. Actually, three joint units of customs, including the NCS, Seme, Customs Intelligence Unit and Federal Operations Unit, were set to intercept the vehicles which were being piloted by a team of military men, led by Captain A.M. Murnai with Force No. 45EB/15FER with Army operation vehicle no. NA2021B05. “Each of the smuggled cars had two soldiers in uniforms inside, as an act of subterfuge and deception, with Captain Murnai inside the piloting van. Punch correspondent learnt that the victim’s remains were deposited in the Lagos State University Teaching Hospital mortuary, Ikeja. Punch Metro gathered that some of the culprits, who were arrested together with their official vehicle, were detained. They were later moved to the Ibereko Barracks, Badagry, on the instruction of the Commanding Officer, Ibereko Barracks, for further interrogation. The Public Relations Officer of the NCS, Mr. Joseph Attah, confirmed the incident. The spokesman for the 81 Division of the Nigerian Army, Lt. Col. Olaolu Daudu, said the matter was being investigated. ”I am in Badagry now to investigate the matter,” he said. Punch correspondent learnt on Sunday that officers of the 81 Division of the Nigerian Army and the FOU, Ikeja, were in a joint meeting over the incident. This is so and absolutely bad and evil, God where are you?